IKEA has always been heavily weighted toward modern & contemporary styles, but they've always had a good selection of more traditional / cottage-style items as well. Recently, my local IKEA featured this charming dining room display. Just lovely. 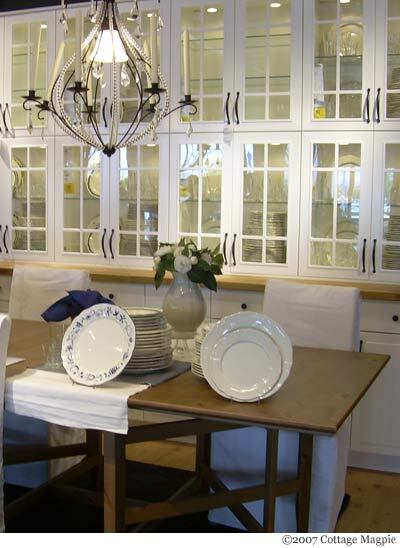 The the white cabinetry with the glass fronts is classic cottage, giving the look of a big vintage apothecary cabinet. However, this look is all stock kitchen cabinetry. The pine gate leg harvest table is paired with white canvas slip-covered parson's chairs, a classic pairing. Then the room is accessorized with a sparkling chandelier and scalloped white dishes. White flowers in an elegant vase cap off the display. All of the elements here are among my favorites. Any room that combines white cabinetry, harvest table, chandelier, white stoneware and flowers is going to exude cottage style.